Majesco Entertainment has announced Pet Zombies in 3D, a new title that they will produce for the Nintendo 3DS. Nintendo's new 3DS personal gaming system boasts 3D gaming sans special glasses along with improved wireless connectivity. In addition to gameplay, the device will also allow users to watch 3D videos and take 3D photos. And Pet Zombies will be an exclusive for the 3DS. Developed by 1st Playable Productions, Pet Zombies in 3D lets players raise their very own decaying human pets by managing their special dietary preferences (brains and the like), bodily maintenance (or lack thereof) and morbid activities needed to keep them happily undead. Players can choose to play with, care for, or even mischievously torment their zombies in creepy locations like cemeteries, evacuated malls or rundown military bases. Each 3D environment is customizable with mix-and-match objects, themed backdrops and even music to best fit each pet zombie's personality and tastes. Throughout the game, players can discover new zombies to add to their horde and customize them with facial bone deformations, variable decay, clothing and unlockable items. Players will also use the Nintendo 3DS accelerometer controls in various activities, including rolling zombie heads through mazes, and can earn trophies and in-game currency to spend in the Zombie Pet Shop. Pet Zombies in 3D is expected to be available in the fall. 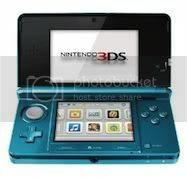 The Nintendo 3DS will be released on March 27, 2011 and is available for pre-order now.